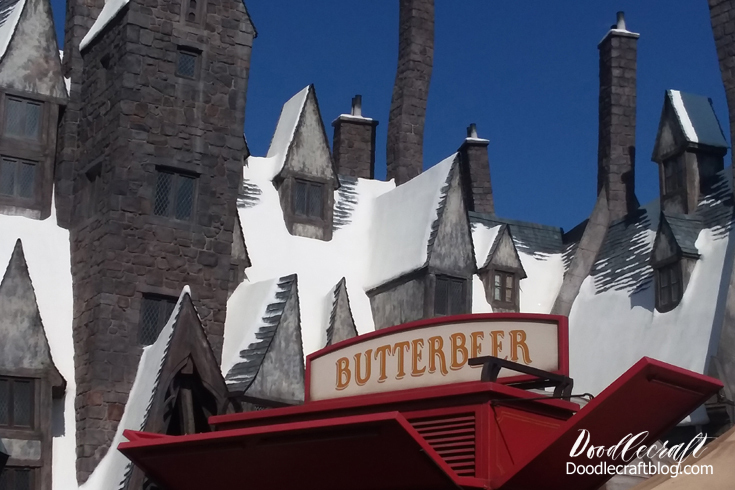 Doodlecraft: The Wizarding World of Harry Potter at Universal Studios Hollywood! 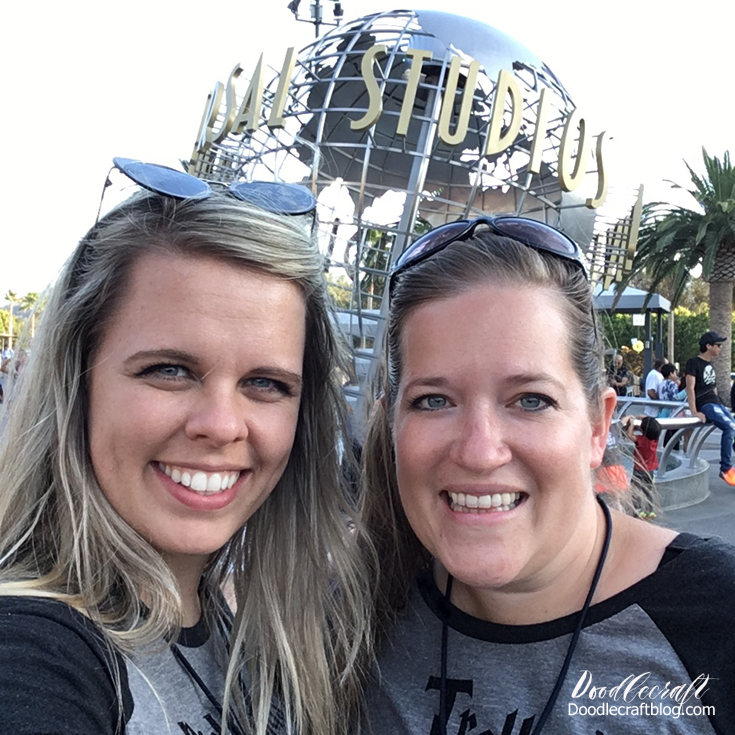 I had the fun experience of leaving my kids home and traveling with my adorable sister-in-law to California! It was so much fun. 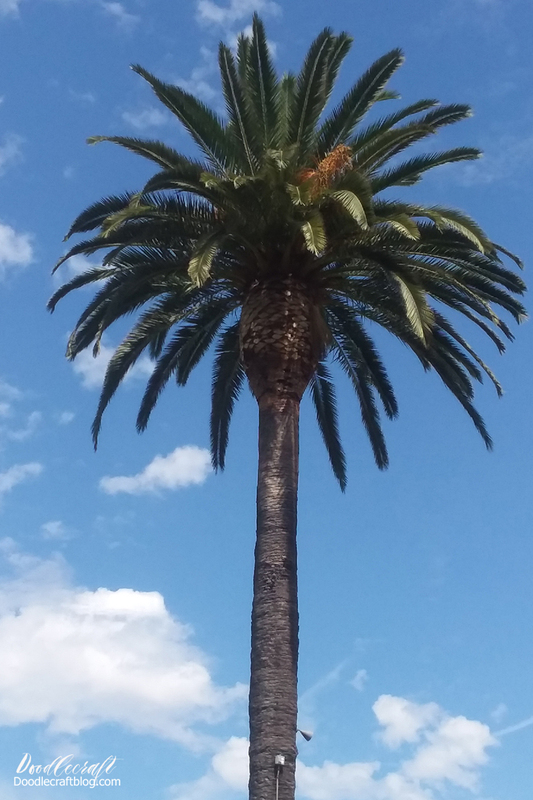 We flew into Long Beach and stayed in Anaheim. We spent an entire glorious Friday in Hollywood at Universal Studios. It was a blast. Everyone deserves a trip without kids! 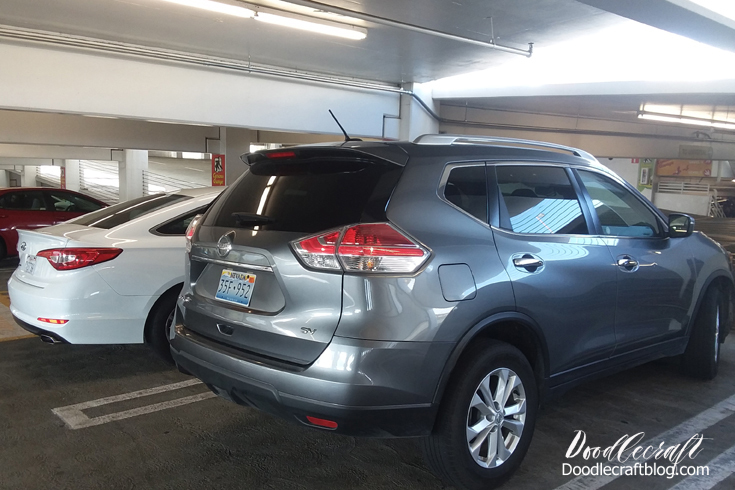 My first tip for travel (especially with a rental car that is unfamiliar) is to take a picture of where you park. We parked on the Curious George level. Easy to reference on my phone at the end of a long day! 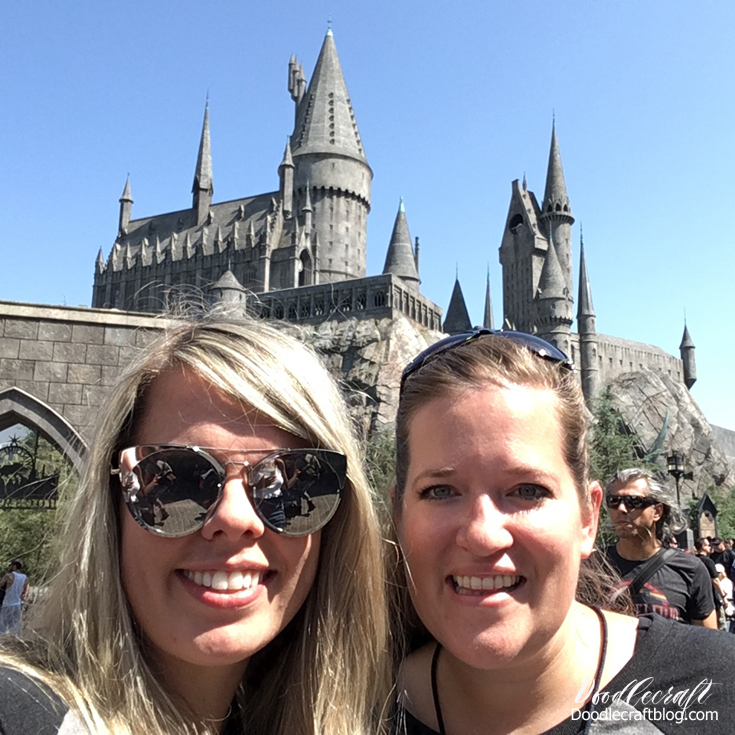 We were so excited about the fun of the Wizarding World of Harry Potter...but actually we didn't rush there first. It's kind of the BEST and newest attraction at Universal, so if you can hold off until afternoon, it's less busy. We went to the Minion/Despicable Me ride first, with just a few people in front of us, we didn't even have to use our Front-of-Line passes. Universal Studios gifted me 2 passes for the park and 2 Front-of-Line passes...which felt totally worth it. Front-of-Line passes let you rush to the front of the line one time on each ride. They scan your lanyard and that is that. Some rides the line was so short, we didn't have to use our Front-of-Line pass until later...so we got multiple rides on some without any wait time at all. We never had to wait more than 5-10 minutes for a single ride! I loved the Simpson ride, the Mummy ride, the Transformers ride, we met Spongebob Squarepants, one of the minions too, The Hollywood Tour was amazing, and I loved Jurassic Park ride. They have a transformer there to meet and greet, as well as a dinosaur, Shrek and Donkey, saw the Despicable Me girls, and a really tall pharaoh guy by the Mummy ride. It was way cool. We went to special effects shows and loved every minute! It felt like being on a movie set! And then we headed to Hogwarts. Of course wearing our fabulous handmade shirts which got lots of attention! 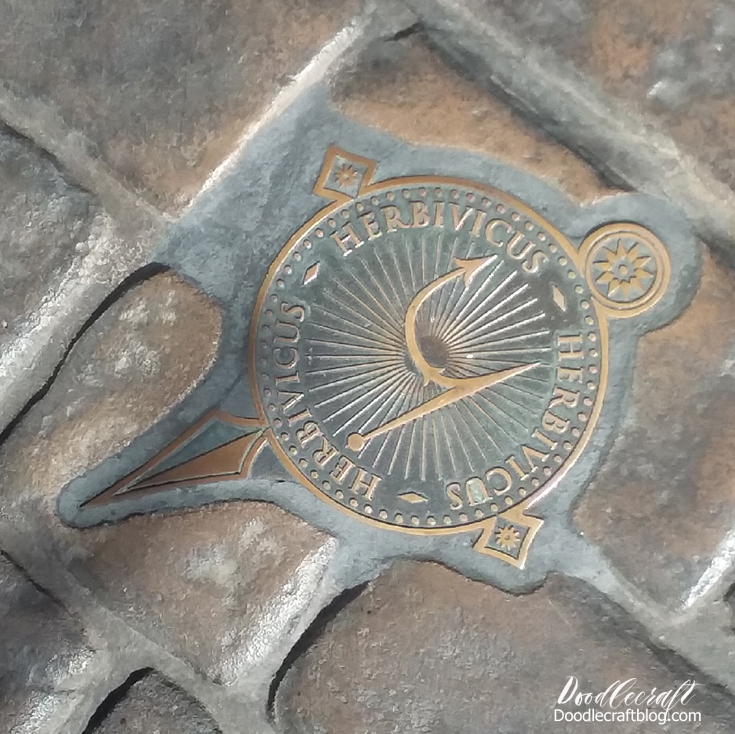 If you buy an interactive wand, you can cast spells all over the Wizarding World where there are these little symbols on the ground. I didn't buy a wand, but there were lots of people that had them and it was fun to watch them cast their spells. I loved the attention to detail in this particular section of the park. It's perfection. Window displays that move, back alleys and amazing store decor! 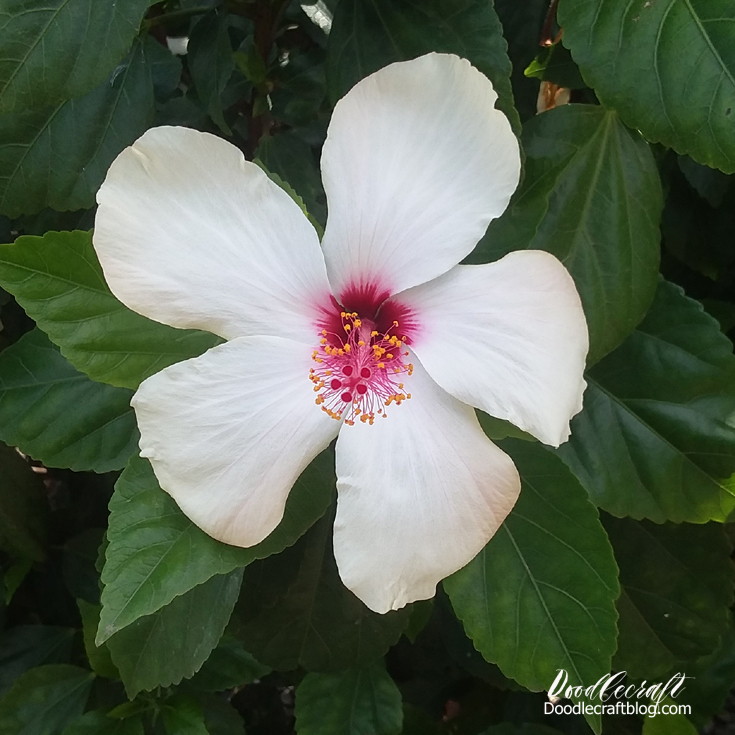 There's lots of fun places to take pictures and wander around. There's loads of crafty inspiration too! 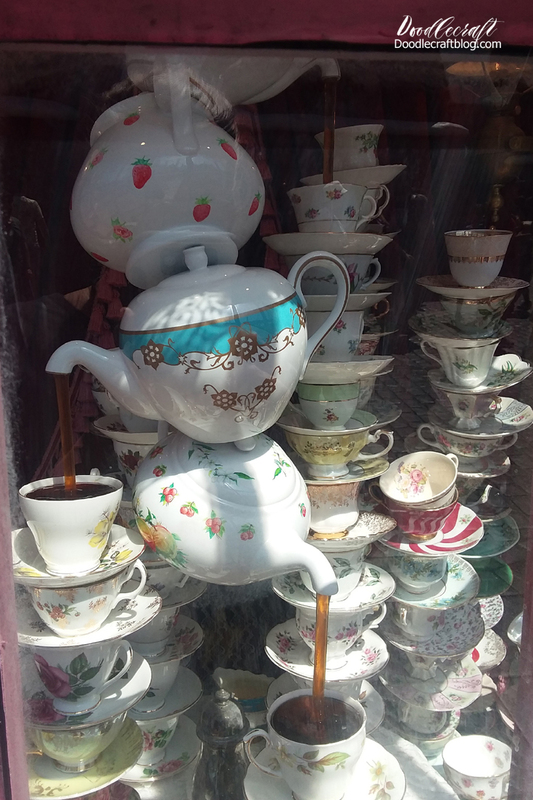 I love these teacup towers and teapot fountains! 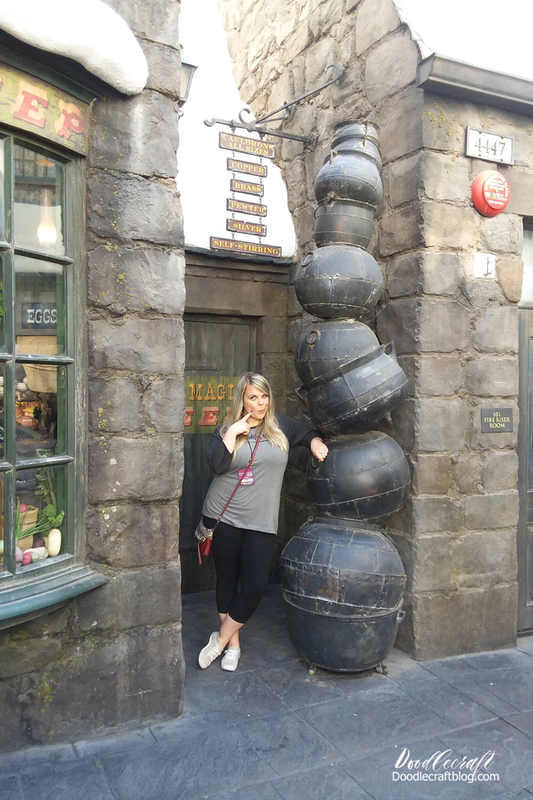 Honeydukes did not disappoint! 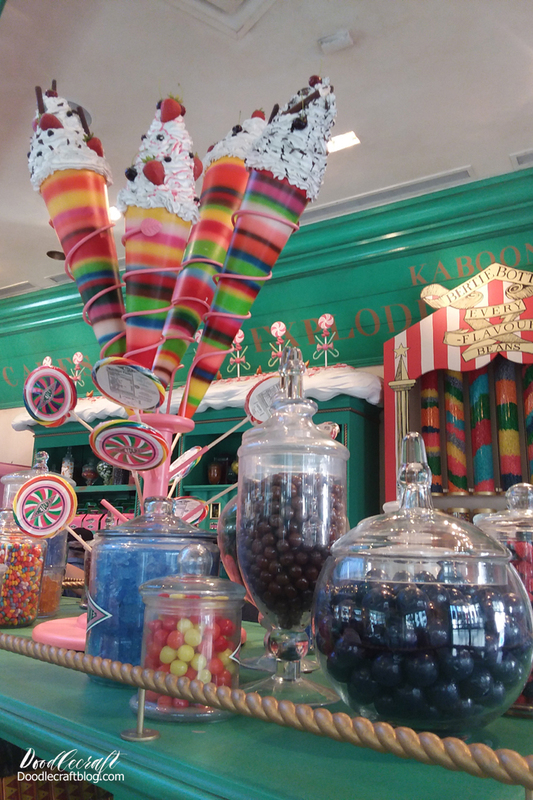 The displays alone are amazing and there are walls and shelves just brimming with brightly colored candy! Backdrops and doors and lots of fun places for picture taking. 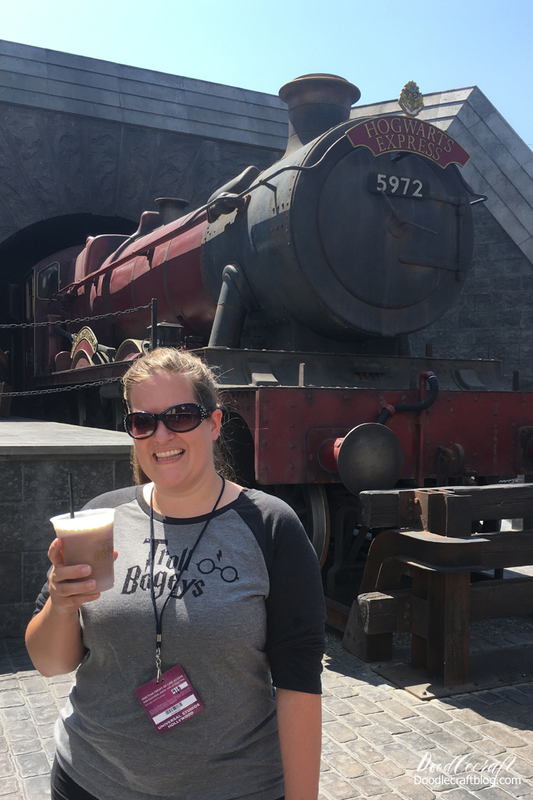 We stopped at the Butterbeer cart for a frozen butterbeer before heading to a special effects show. The frozen butterbeer was awesome and tastes like a cream soda slushies...with hints of butterscotch. There wasn't even a line at the drink cart! 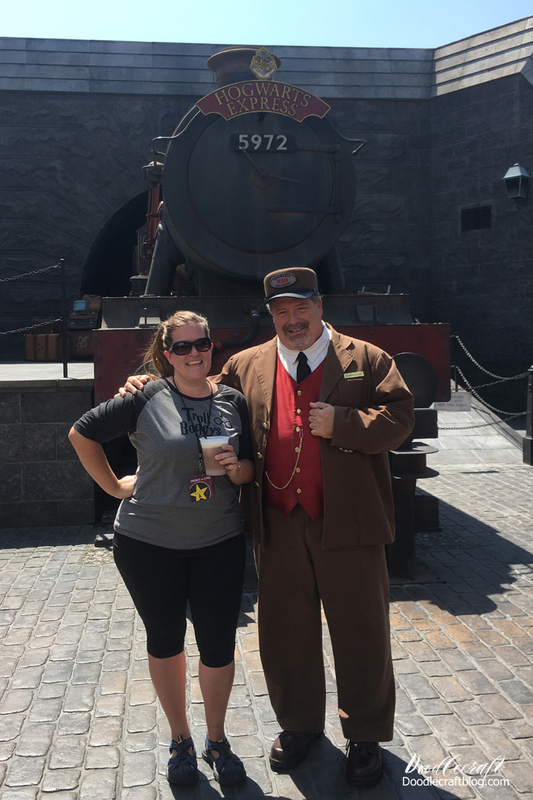 Of course there is the Hogwarts Express train on platform 9 3/4 with a friendly conductor. He was a bloke from England, so naturally we chatted a while! It was this trip that I realized that my sunglasses make my ears poke out...ugh, oh well. Larger than life props and sets make you really feel like you are there! 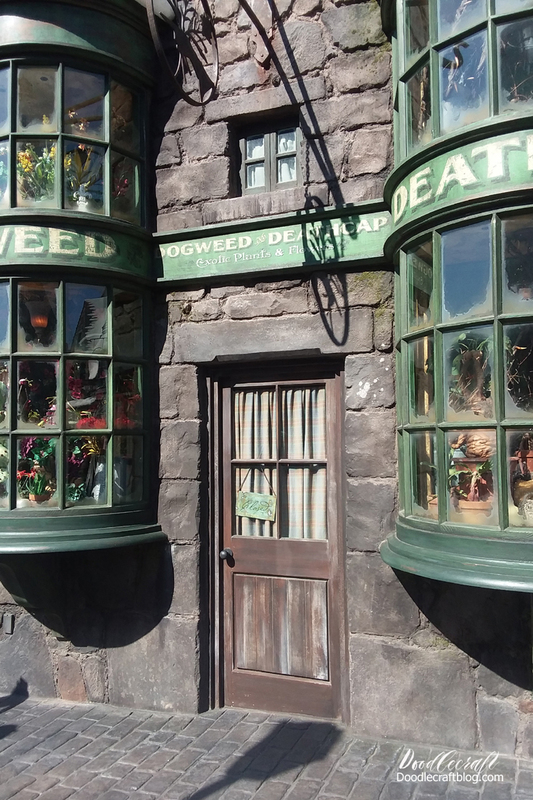 Okay, one of my favorite places is the bathroom of the Wizarding World. If you hang out in there long enough, you'll hear Moaning Murtle. It's a great place for a pit-stop that is entertaining! 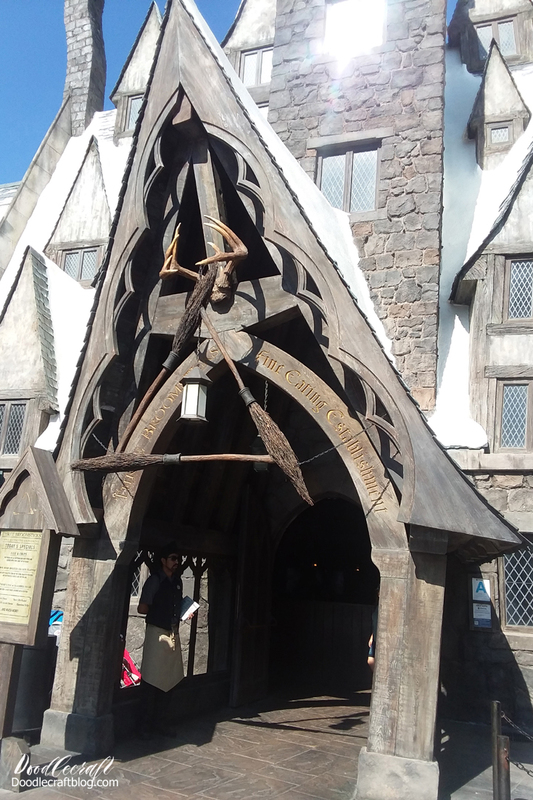 Apart from the beautiful landscape and palm trees that California has to offer, Harry Potter world was amazing. 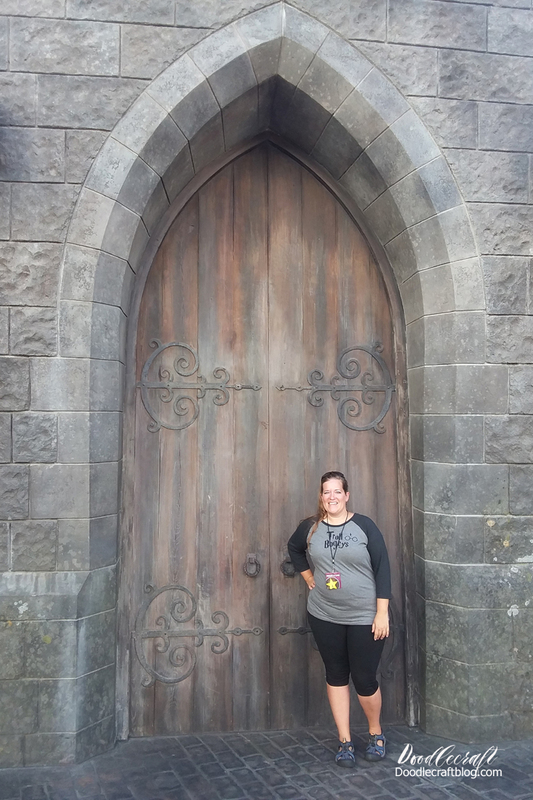 I had a wonderful time at Hogwarts, the Harry Potter ride is so fun! Nearly every ride at Universal Studios is like a 3D movie with seat motion. If you get sick easily from 3D movies, you may want to pace yourself at Universal. Our Front-of-Line passes got us through the line so fast, we didn't have time to enjoy the interior decor of Hogwarts. I loved the walls lined with picture frames and moving pictures. I really felt like I was at Hogwarts! Such an amazing trip with my cute sister! I totally recommend a girls trip--best idea ever! 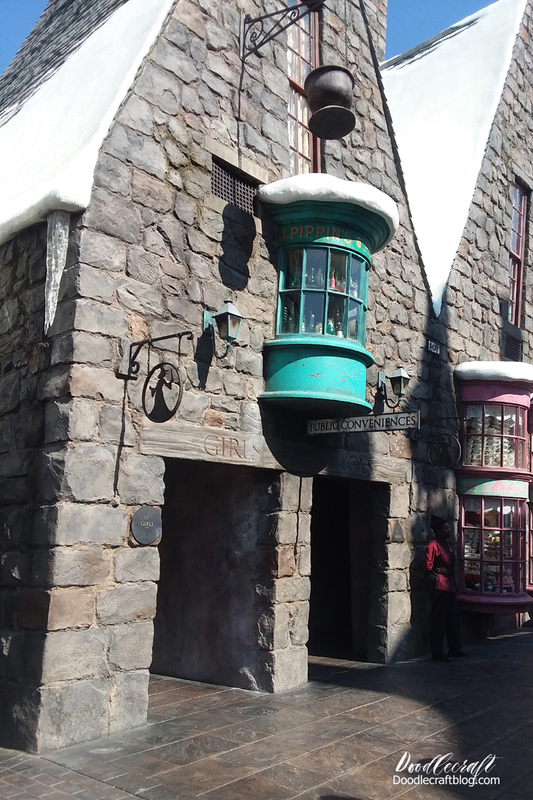 Check out these other fun Harry Potter Posts too!